Beautiful decorating on a shoestring budget is something that a lot of us wish we could do. For most of my life, it was that or nothing, so I completely understand about not having the funds to do whatever I wanted. And actually, I know some very wealthy people who don’t want to spend a lot of money on furnishing their homes. This is a special treat today about a reader, Laura with a very interesting story involving a pipe organ. She has created the most charming music room with very little money. But, wait until you see the before. And you are not going to believe your eyes when you see her gorgeous art wall that looks like it must be thousands and it cost almost nothing. Why are you scrolling down? You come back here right now! ;] haha. I now am going to hand you over to Laura; please take it away. She makes decorating on a shoestring budget look easy. First, let me gush for a moment and tell you how much I love reading your blog. Okay. I’ll go grab my raincoat. Thank you so much for your kind words, Laura. I appreciate that immensely! Now on to why I wrote you, today. I commented a few weeks back on a post about ‘drab gray’, but mentioned my husband has a pipe organ and collects antiques, which has been so hard to meld with my more modern aesthetic. Yes! I remember reading that. I’m also 12 yrs younger which further divides our tastes. I have seriously felt like a stranger in my own home for years because nothing feels like me. It’s actually a really empty, sad emotional feeling that’s hard to explain, but very real. I do know that feeling, but probably for different reasons. This struggle is what led me to your blog and slowly I have seen how beautifully one can combine styles, giving me hope to finally find a balance. Even my tastes are “growing up” and evolving from your imparted wisdom. I’m so happy to have been steered by an actual design professional, and not the hoards of bloggers spewing trite “Farmhouse” decorating cliché nonsense (that my friends have embraced). Blech. (and not much cash on hand (because we just bought this house), I set out to tackle the first room one sees in our home, the Organ room. The result, I have to say, almost brings me to tears. I feel like it is such a success, especially considering I mostly worked with what we had, only spending about $1000. And most of that was the light fixture, rug, sofa, and window panels purchased on super Wayfair closeout clearance. But I feel like I was able to do it because I knew what styles I was looking for and had a good plan that gave me confidence! Laura, these words I know, are from your heart and it means so much to me. I sit here working in isolation many hours and even though I stare at my stats (my entertainment haha) and see big numbers, it doesn’t really feel real. And this is not a ploy for more feedback. haha So many of you are already doing that and I love your emails so much! I’m truly blessed. Okay, Laurel, brace yourself because first I’m going to show you the before. Oh, dear me Laura. Thank you for the heads up. So bad, so bad! Even the poor doggie has turned to stone. And here’s the yucko army-green paint with the weird paint job on the wainscoting and coffered ceiling. I’ll say. Although, I’ve seen this done before and it’s okay, I guess, but, it’s not working here. Okay, I’m a little nervous showing you, even though I couldn’t be more pleased. I’m attaching two photos just so you can see what I’ve done. I am beaming with pride, but of course I realize these probably won’t seem all that impressive to you! Are you kidding me! I just fell over I’m THAT impressed and immensely proud of you, too! but I am truly so happy that I have found a piece of what feels like home in my life! Thank you, thank you thank you for all you do. Now on to tackle on our family room! Dang it…… now I’m depressed again. 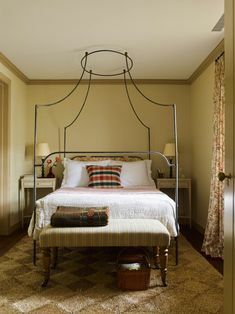 This room is reminding me of the charming living room with the high ceilings and gorgeous mouldings. Remember? But, what confused me a little is that the previous owners were using it as the dining room which means that the kitchen must be nearby. Since I had nothing else to go on, I wrote Laura back and told her that I’d love to do a post about this and asked her a few questions which she dutifully answered. We live in a mostly rural farming area in Northeast Ohio. That’s right. The SNIRT belt and we have it for six full months! The original idea for why we bought this house was to move my aging father-in-law in with us after his wife passed away. But then after everything was a done deal, with moving day only weeks away, my F-I-L informed us that he met a woman and she would be moving in with us! That certainly changed things but, needing to work this out, we gave them the real den off of the entry hall. It’s the room with the French doors and is now their living room. Fortunately, they’re the loveliest people, but I’m not even 40, with 2 young kids, trying to navigate a life and multiple careers– here at home. My own family is across the country in Arizona. It can get rather hectic and stressful at times. But, there are also positives to having my father-in-law and girlfriend here. Oh, wow! That’s quite a story. The organ, of course needs a home and the only place left was the dining room which also doubles as our little living room. In addition, it’s a music room as both my husband and I are professional musicians. There are a myriad of instruments. Here, looking into the orange-flavored CHERRY-wood kitchen you can see my cello in the corner and cases for other instruments. One of them belongs to my older daughter, age five. What can I say, we’re a musical family. Oh stop! The cuteness is killing me! But, thank you for letting me post this adorable photo of your daughter. I love that tiny violin! She said that the final tally for the room was actually $1,350.00, including paint and other supplies. What’s awesome is that she had a base from which to begin with her husband’s rockin’ antique pieces that he had inherited when his mother passed. Ceiling light: Montelena 5-light Shaded Chandelier $175 at Wayfair. Wayfair apparently discontinued the 5-light—maybe that’s when I snagged it at that price. Below, there’s a small widget with about seven other chandeliers that are also very reasonably priced. Rug: $250 Miara Cream Rug 10×13 Its not going to last forever, but for that size at that price?! I have some bad news. It IS going to last forever. ;] It’s polypropylene. But, I had no idea from the photo. Sofa: On “Wayfair Day” this baby went down to $525. I had read your post on the best sofas to buy and this one too about the number one sofa at least 20 times, and knew this could fit the bill, but it didn’t have great reviews. I took a gamble on the quality and it paid off as I’m very happy with both the quality and comfort of this sofa. Phew! But, I look at the reviews, because it’s good to know WHY folks are giving a low number. Sometimes people want to be mean for no reason whatsoever except that they are sadistic freaks. But a couple of people complained that the measurements are inaccurate. So, we have to consider if they even know what they are talking about. They say that the sofa is only 31″ high. Yes, to the back RAIL that sits behind the back cushions. The pillows are always higher. But, it’s not an exact science because well, they’re pillows and scrunchy. I can see from Laura’s images that the sofa is at least 34″-36″ high. Window Panels: $225 loads less than velvet, but still looked to have a lush texture. Mine are the Juniper Berry colorway in 120″ length; I hemmed them myself and added drapery hooks (to hang higher to cover my make-shift DIY rod) and rings. I notice that they are a shade off from the wall color and I actually really love that. There are so many greens in the room and this reflects that. Paint is BM Jack Pine in flat/matte with Simply White semi-gloss (thank you Laurel Those are both beauties from your curated paint and palette collection.). Accent pillows were from a home stagers warehouse clear-out sale, $5 ea. The end tables were on clearance at Walmart this summer for $17ish ea. Ordered the flowers from Amazon, maybe $3 a stem. A few of the art pieces we had, but about half a dozen were printed on my large format color laser. (in addition to being a flutist, I’m also a graphic designer and photographer). Wow! You’s so talented and the art wall is my favorite part too. It’s what you see when you first walk into the room and it compliments the wall color so beautifully. It totally makes the room! So yes, with paint about $1,350. That is outstanding! And I love that the supporting players aren’t terribly flashy. They don’t need to be. Below I created a small widget that has about ten items, mostly ceiling chandeliers that are under $250 and most of them way under that. I tried to choose pieces that are stylish and don’t look super-cheap. Some are quite modern and I think that’s a good move for this room. Laura wrote to me in a later email some interesting info about her luscious art wall. I wanted to use a portrait on the gallery wall and had a mass-produced print that seemed to work. But even after putting it under the wavy antique glass of a Victorian frame, it looked terrible. So I used matte Mod Podge craft glue and with a brush, replicated strokes following the print, let it dry and repeated. Behind the glass, it looks like canvas! Win! I asked Laura how much space is there between the sofa and organ bench. It’s only 53″ and since this is a major path, a coffee table won’t work. The view of the music room is stunning, but the cabinets do look quite orange in this photo. Brace yourself again, this is the family room. “It’s beyond overwhelming,” Laura said and continued. I know. The giant furniture is overwhelming and obviously the wrong colors. 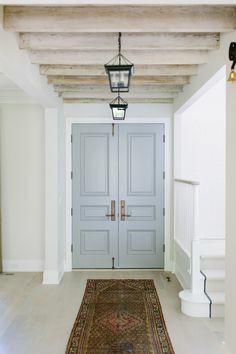 Although I LOVE the Benjamin Moore Washington Blue that sort of balances the overpowering orange wood, it is WAAAAAY too dark in there), wall-to-wall built-in with ridiculously sized niches — it’s next on the list. Though, with how long I had to wait to find pretty pieces at rock bottom prices, I’ll give myself maybe $2500+ for the family room. Wow! That might be tough; especially if you want to replace the cabinet. Just taking it out and repairing the wall is pretty expensive unless you guys do it yourselves. I imagine that you have to be careful with your hands? As an aside, I have found literally no help/ideas online trying to rework my kitchen with no windows. The kitchen lives between the breakfast/table area and dining room, and as much as I’d love to do an unkitchen, I don’t have any pretty windows illuminating the space. And according our friend/contractor, taking down the wall in between the kitchen and family is not a realistically viable option. Just putting that out there maybe as a future blog topic. This has been incredibly interesting Laura. I want to make a few remarks. First of all, as you know I think that you did an outstanding job; particularly with so little money. The only thing I would probably recommend is that the area rug be a little smaller next time. ALTHOUGH. I am thinking that the organ can’t be half on and half off the rug. Or maybe that’s all that was in stock at the time, that you liked. Normally, I recommend a minimum of about one foot of wood showing around the room, but usually 18″ to two feet. It all depends. The rug could be floating even more. I think that Wayfair should use your image of the curtains for their advertising. Their photo makes those drapes look cheap and yours look luxurious. Note to all. These are black-out drapes which have both pros and cons. The pro is that the color will remain constant as the day-light can’t go through it. The con is that they will block some light. But this appears to be a bright south and maybe west-facing room, so black-out is an excellent idea. I would also look into having some UV film applied to the glass if it is not there already. Over time, if the hot sun is filtering through the room, it could harm the furniture and maybe even the organ! I LOVE love these big beautiful windows and with transoms! And, this is a lovely house, however, there is a LOT of wood. But, it seems to me that its biggest problem is that it can’t decide if it wants to be a craftsman-style of some sort or a Victorian-ish style home. Lotte’s home from Sunday is the real-deal Victorian. One thing that is bugging me when you guys can swing it. I would definitely consider changing the front door. If you click that link, you’ll see some similar doors. This makes Laurie (me, to be clear) very cranky. And while I adore the interior doors and transoms, I’m also not crazy about the ersatz (laurel’s favorite word) frosted glass with the trying-to-be Craftsman design in the interior transom windows. It’s not real leaded glass and this isn’t Taliesin. But, but, but, there is so much potential here. Just look at how the music room came to life. You can do this! I do love the gorgeous high ceilings and the coffered ceilings too. Over-all, I think that this home is really more Victorian than Craftsman, and I think knowing that will be helpful when deciding what gets painted and what stays as wood. You can see some authentic Craftsman and Victorian homes here and how they are painted (or stained). As for the kitchen and family room, plus eating area. I told Laura that if she sends me a floor plan of the entire area, that I might be able to work on this one. These are not uncommon problems. This is the heart of the house, but that’s just it. It’s dark and does have a ponderous vibe, as is. However, we can discuss north facing rooms and rooms without windows and ways to integrate this area to make it as warm and inviting as the beautiful music room. One last look before I send this one off. Thank you so much Laura for not only sharing your lovely home with us, but a part of you and your lovely family, as well. BTW, I didn’t comment, but I love the dark green velvet chair and then repeating that one pillow on the sofa. Muah! Really great. I think that you got the balance just right. PS: I almost forgot. I recorded a podcast recently for these lovely women who have a professional organizing business called Spark Joy. No, it’s not Done and Done. It’s only 19 minutes and I talk about a variety of topics related to interior design. Enjoy! 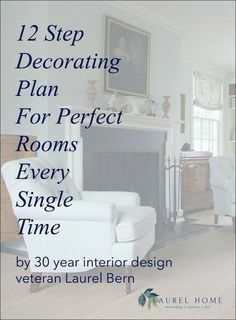 What a wonderful post, congratulations to Laura for designing such a wonderful room. I have a similar shoestring budget and I’m hoping to tackle my living room over the next year. Thanks for the inspiration! Oh my goodness, I LOVE your reading your blog so much, I’ve cancelled every other one. And the funny thing is, we live in a very small motor home. Perhaps 180 sq ft when it’s all open. Tonight we are on our way to Zion National Park for 2 weeks. The thing is, I know we won’t do this forever and one day we’ll build and it’ll be Hammertime! Uh … Berntime! You’re so much fun and educational. Honestly, I did look at everyone listed on google in my area. I must say that looking over their portfolios scared me to near shock. The interiors that they were calling AFTER should have been BEFOREs. I thought it must be because of the area that I live in and the concentration of peoples who still seem to want to live in the 90s ERSATZ ITALIANATE style. There wasn’t ONE that I would have paid to do anything for me. I’m not trying to be all high and mighty here. What to do in such a case? How far reaching do we need to go before finding someone that can relate to Neo Trad and would still be willing to travel? Oh gosh, that is a problem faced by many and it could be a cultural thing and/or the population is not large enough. Or, they might have your style, but don’t take on small jobs. This is another reason that I’ve written these posts about the design process. Really nice job. Love the colors. The Sofa is pretty and I really like your gallery wall. There’s a product by NO Sags, INC. bought on Amazon, that will revive a sagging bottom cushion. Our basement sofa still Looked good But was saggy. Also, The back pillows on my sofa became compacted and deformed, so I figured I had nothing to lose. I opened them up and cut open the lining, and Re shredded the fiberfill and Restuffed them. World of difference. Laura, you did such an amazing job on your music room!! I think it looks stunning, and just the right mix of antique and more modern pieces. It definitely looks like you spent way more than what you did. In looking at your kitchen, I realized that we have the exact same cherry cabinets, which I also inherited from a previous owner (and of course they don’t go up to the ceiling). I also inherited pink(!) granite counter tops. Pink. Granite. I haven’t gotten the money together to redo the kitchen, but I will say that what helped me a great deal was painting the kitchen walls a nice grayish blue. Oh dear, yellow and pink- I also found out about that bad combo when I chose one of Laurel’s lovely paint palettes for our renovation, which had a lovely coral-pink. Problem is I didn’t think about our flooring, which is bamboo (new from prior owner, sadly, so I can’t bring myself to rip it out). Anyway, thank goodness I painted a sample board and laid it casually on the table. I was walking by, glanced down and quite accidentally saw the HIDEOUSNESS of coral with the yellow/brown floors. Kudos to Laura. Being able to pull off a stylish yet affordable makeover while juggling a large family couldn’t have been easy. First, Laurel what a thrill for my home to be featured on your blog. I may (or may not) have let out the most embarrassing squeal when I saw your message in my inbox. Perhaps something akin to the Brady Bunch episode where the Brady girls meet Davy Jones? I’d never admit it though. 🙂 Next, thank you all Laurel readers. I was nervous to read the comments, (especially after partially exposing you to the TOTALLY ORANGE world I live in) but Laurel assured me that her readers are among the most lovely earthlings in the universe. I totally agree. My heart is so full, it may just burst. Davy Jones! Oh, no, you didn’t, Laurel … ok, that was me… I’m the crazy woman who compared my obsession with Laurel and her blog to my childhood obsession with Davy Jones and the Monkees. Unless, of course, you coincidentally have the same obsession, Laura! Hahaha! Within 30 minutes after I’ve come home from work, I’ve got my laptop open looking for a new blog post! “I wouldn’t live without her, even if I could!” Hahaha! Your home is beautiful, Laura. You must feel a great sense of satisfaction. You saved a ton of money and your music room is gorgeous! I swear to anyone reading this, that I have not paid Donna to plug my guide! Overstock is great for rugs. It’s where I got my new bedroom rug and I love it. The colors looked exactly like the photo which is so rare and actually not that easy to do as Oriental rugs do have a nap. This one isn’t very pronounced, but some are. This is a super-interesting post! I’d love to know how Laura designed her art wall. Regardless of the cost of the art, the arrangement takes a lot of skill. Holy cow. That transformation would be remarkable at five times the price! But at just over $1,000? Brava, Laura. LOVE this post! 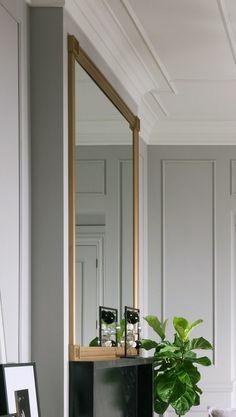 While I enjoy looking at rooms done by decorators (with a large budget I assume)seeing a beautiful room done on a budget, by a regular person, is so inspiring!! Thank you for such a kind comment. I realize that some designers don’t like to give out all of this information– for free, that is. This is how I look at it. First of all, the people that are utilizing the information were never going to hire an interior designer in the first place. It is still only a tiny percent of the population who hires an interior designer/decorator to help them furnish their home. Most people don’t and the vast majority have no idea what’s involved or the millions of landmines just waiting to explode in their face. I mean, you wouldn’t try to deliver your own breech twins, would you? ;] Well, decorating a home is no different. It’s just not usually a matter of life and death. But, it sure can be expensive. So, my aim all along has been to give the talented Lauras of the world, and even those with lesser abilities, the skills to create for themselves, a beautiful home. For the rest of the population who DO hire interior designers, the original intent was for them to see that I (usually) know what I’m talking about and have had the experience to make them feel comfortable, etc……. And, man, it worked! And then, I started getting, not only calls, but calls BEGGING me to help them. Total strangers. I mean, I could be a serial killer. but no, they were ready to sign the contract and pay me whatever. That is the power a blog can yield. This is really aimed at all of you designers out there who are wondering how to get your phone ringing. Buy my blogging guide! It is not just for full-time bloggers! For me, there was a shift around three years ago, where I was absolutely about to lose my mind. I was very busy with client-work and trying to run the web-site, and grow it, plus writing my books and without any help whatsoever. There’s a post here about a client with a busted coffee table. Well, I know it was two, but actually, yes, THREE times the freaking table came in busted. The first two times, it went back. The third time, it was minor enough to get fixed at the receiver. My normally exceedingly lovely and patient clients were understandably miffed. I was livid! I did love working with people and helping them create more beautiful homes. But, I can still do that and on a far larger scale, this way. It’s very gratifying, plus I’m FINALLY for the first time in my life, making a decent income. It’s a win-win-win! If any designers think that I’m making it so that people won’t want to hire them, I disagree. I believe that what I’m doing is hopefully elevating the profession. And, it’s also showing just how difficult it is to put together a beautiful room, thus conveying that they really should seek out pro help if possible. I always encourage people to at least consult with a designer. I agree with your comment about being more open to using a designer after seeing all the moving pieces to getting a fantastic room! I think one of the main reasons more people don’t use a designer is that they are intimidated–thinking only ‘rich’ people use designers. A misconception you have addressed. Sorry, the copy editor is coming out in me. The word is muntins, and mullions are the dividers between double or triple or grouped windows. Back in the day muntins held panes of glass, but nowadays they are usually simulated and are not true muntins. Mullions used to be a structural member to help support the wall above the window between individual window units, but nowadays they are usually integrated into the entire window to make it a single unit. Hello Laurel, I am impressed with what Laura did. She not only found solutions to many individual problems, she coordinated them wonderfully as well. Ha, ha, I have to admit that my first thought when scrolling down was that budget or not, that front door would have to go, even if that meant going at it with a Sawzall and framing-in a simple rectangular glass panel. Apologies again, for missing your email. For anyone reading this, besides Jim. I saw his comment and immediately flew over to my email to rectify the situation. I was just a wee bit tired on Sunday morning and inadvertently missed it. Thank you for corroborating my aversion to the ubiquitous, fake Victorian front doors. Yes, it’s the oval that’s at the heart of this. Oh, I’ve looked and looked and looked and I cannot find such a door that’s authentic to the Victorian period; not even close! But I also understand Laura’s situation, all too well. She’s a momma to two darling angels, (that’s full-time job #one), but then, works full-time at multiple jobs which some no doubt include teaching, I’m presuming. And then, there’s her own practice of her instruments. I know that at the very least, she plays the cello and the flute. Plus, all of that, needs to be worked around her husband’s schedule. Although, I can imagine that she practices in their bedroom sometimes. That thought has occurred to me as well. In fact, in the music room, the previous owners are the ones who painted the coffers and wainscoting. I am positive that they were originally stained like the rest of the wood. And I base that on the fact that the window casings are stained. I have to say that the color of the wood looks so fabulous with the curtain fabric and wall color. But if I were painting everything else, I would probably paint the trim as well. Congratulations Laura on a job well done. What I love about that room, is that it looks so personal, and not a generic looking ‘display home’ room. To achieve such a beautiful transformation, with so little, and canny sales shopping, is a coup! Inspiring. As a former music teacher , I can tell you that’s a great teaching room. Plus there are actually people who want to learn pipe organ and would be happy not to have to go to a big cold church in Winter for lessons! Well done on the renovation. I’d just paint the wall unit in the family room. If hubby is in love with wood, as most of them are, you can just use a tinted brown varnish (varnish with stain in it) to take the orange out. Then get a cabinetmaker to match the colour with doors for the niches. If it is all too dark, look at solartubes. They make a huge difference. They can do a 30’ tube so can duct light from upstairs. Other brands available. Is a great solution where the wife wants to paint woodwork but the hubby won’t agree. I’ve had two, made a great difference. I can’t believe that you found a budget alternative to the Morris Lantern (The Burkeville). That is an 80% discount!!!!! Way to go.